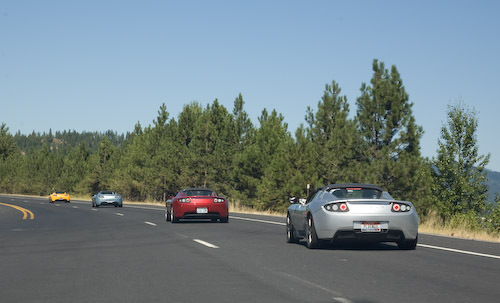 In August, 2011, we drove to Coeur d'Alene to visit our friends and see a show at the Coeur d'Alene Summer Theatre. Rob let us use his charging station and Diane was kind enough to give up her spot in the garage so we could alternate charging. In fact, we were able to make good use of the 120V outlet and the 240V/40A charging station to charge both vehicles simultaneously. 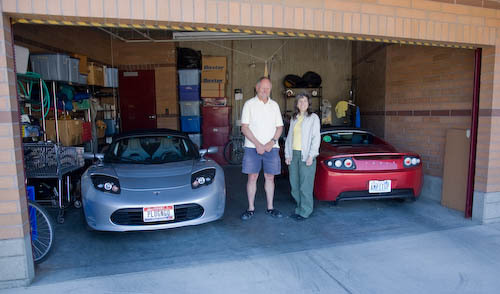 Shortly after we plugged in, Cathy joined Rob for a dual-Roadster garage photo. 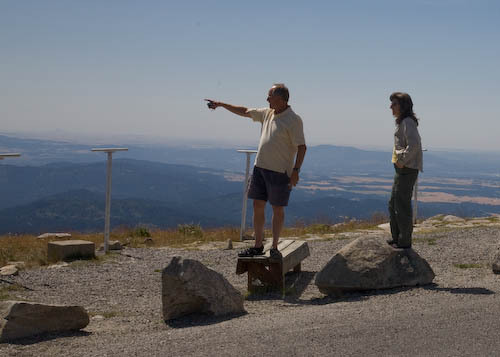 Rob took us up the fun, twisty road to the summit of Mt. Spokane. 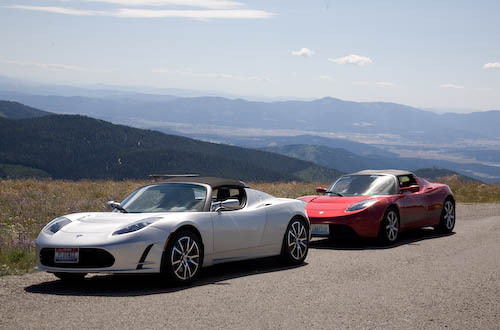 With only two seats in the Roadster, we had to drive both of them up there. We didn't mind. 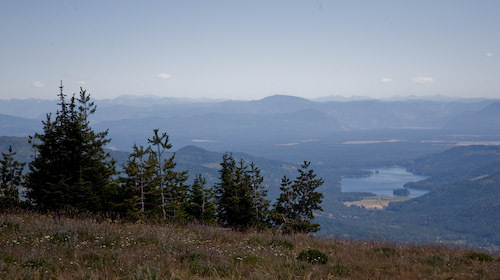 One of the many lakes visible from the summit. 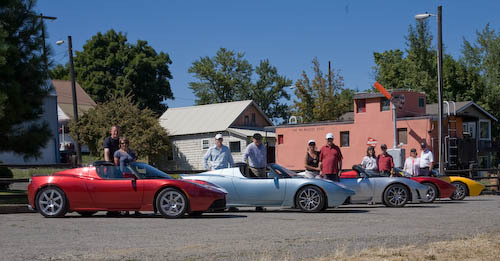 We rallied the local Roadster owners: two from Coeur d'Alene, two from Spokane, and ours from Seattle. 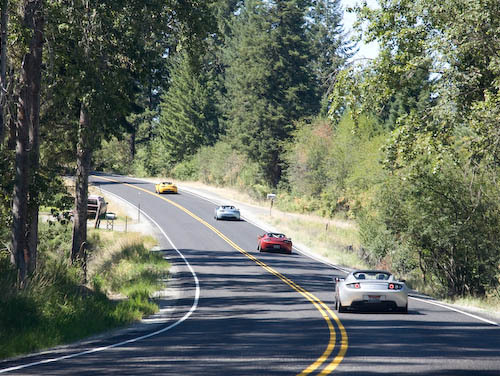 The local owners hadn't met in person before, so it was a great chance to share stories while using a drive around Lake Coeur d'Alene as our excuse to gather. 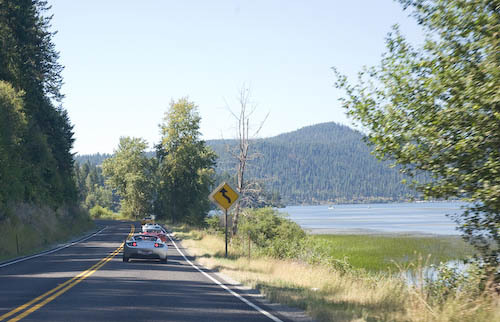 We stopped in the tiny lakeside town of Harrison, ID, and created quite a stir. 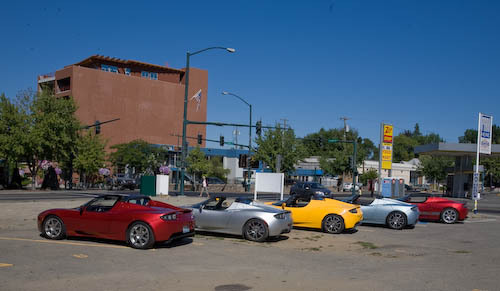 Most people hadn't seen a single Roadster before, much less five parked in a row. Group portrait, left to right: Brian & Syndi, Pat & Tim, Diane & Rob, Cathy & Tom, and Deb & Warren. ... add in lovely lake views and you have one of the best drives we've ever done. Freeway back to Coeur d'Alene.